Latest statistics released by the Statistical Institute of Belize show that the All-Items Consumer Price Index for the month of May 2017 stood at 104.4, an increase from 103.7 in May of 2016. The prices of goods and services regularly purchased by Belizean Households were, on average, 0.7 percent higher in May 2017 than they were in the same month of 2016 (see Figure 1), as higher prices for ‘Transport’- related goods and services overshadowed decreases in various other categories, including ‘Food and Non-Alcoholic Beverages’ and ‘Recreation and Culture’. For the first five months of 2017, a year-todate inflation rate of 1.7 percent was recorded. Prices within the ‘Transport’ category rose by 8.3 percent from May 2016 to May 2017 (see Figure 1), continuing their upward trend, albeit at a slower rate than in previous months. International airfares were significantly higher than they were in May of last year, although it should be noted that some reduction in fares was recorded following the spike experienced in late 2016 to early 2017. Bus fares were almost 8 percent higher than they were in the same month last year, reflecting the increase that took effect in October of 2016. Fuel and lubricant prices for the month of May 2017 were up by 6.5 percent from the same month in 2016, with the highest increase being seen in the price per gallon of Premium gasoline, which rose by 18 percent from $9.06 in May of last year to $10.72 in May 2017 (see Table 1). Diesel prices increased by 16 percent from $8.19 to $9.47, while Regular gasoline rose by 14 percent from $9.08 to $10.35. The ‘Housing, Water, Electricity, Gas and Other Fuels’ category saw an overall rise of 0.3 percent when compared to May of last year. This was as a result of higher prices for Liquefied Petroleum Gas (LPG), which overshadowed a slight decline in home rental prices. The average cost of a 100-pound cylinder of LPG rose by 18 percent from $83.90 in May 2016 to $98.83 in May 2017 (see Table 1). On average, there was a 0.6 percent decline across ‘All Other Categories of Goods and Services’. ‘Recreation and Culture’ was down by 2.8 percent due to decreases in entrance fees to sporting activities and night clubs, while smaller price reductions were seen in women’s and children’s clothing, health insurance premiums, and ‘Furnishing, Household Equipment, and Routine Household Maintenance’. Across the various municipalities, Dangriga recorded the highest increase in consumer prices for the month with an inflation rate of 2.9 percent, as consumers in that municipality actually saw home rental prices rise in comparison to May of 2016. Orange Walk Town, where home rental costs fell by even more than the national average, was the only municipality which saw prices decrease for the month, with an inflation rate of negative 0.9 percent. (see Figure 3). May 2017: For the month of May 2017, Belize imported goods valuing $161.3 million. This represented a 4.2 percent or $7.1 million drop from the same month in 2016, when imports totalled $168.4 million. Decreases across various categories led to the overall reduction in Belize’s import bill. However, ‘Machinery and Transport Equipment’ saw the most considerable decline for the month, falling by $11 million or 24 percent to $35 million, as the country imported less telecommunication parts, sealing machines and water pumps. A reduction in the quantities of Diesel, Regular and Premium fuels purchased resulted in a $3.5 million drop in the ‘Mineral Fuels and Lubricants’ category. Dwindling wheat seed imports drove the ‘Food and Live Animals’ category down by more than $3 million from $23 million in May 2016 to $19.5 million in May of 2017. Decreased purchases of pine lumber and natural asphalt led to a $2 million decline in imports of ‘Crude Materials’ from $5 million to $3 million over the period. Of note, importation of ‘Beverages and Tobacco’ for the month fell by $1.6 million, from $4.4 million to $2.8 million, as the country purchased less cigarettes and beer from abroad. Notwithstanding these decreases, the month of May 2017 also saw noteworthy increases across some categories. Imports of goods to the ‘Commercial Free Zones’, which were meant solely for re-exportation, rose by almost $4 million during the month from $20.4 million to $24.3 million, due mostly to a spike in purchases of cigarettes for re-export. While heightened purchases of cement and metal roofing prompted a $3 million growth in the ‘Manufactured Goods’ category from $18 million in May of last year to $21 million in May 2017, lighting fixtures and medical catheters led to an increase of $3 million in the ‘Other Manufactures’ category from $13.5 million to $16.5 million. 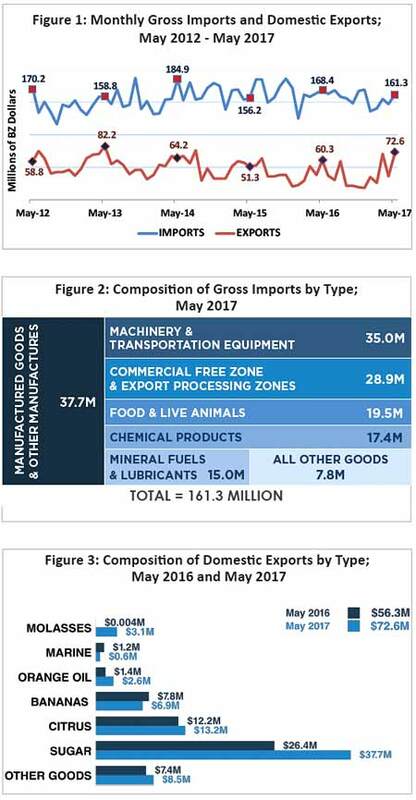 Importation of ‘Chemical Products’ went up from $15 million to $17 million, as Belize bought more fertilizers than it did in May 2016, while increased shrimp feed imports resulted in a $1.5 million growth in the ‘Export Processing Zones’ category. FIRST FIVE MONTHS OF THE YEAR:Merchandise imports for the five months from January to May 2017 amounted $739.6 million, representing a 4.8 percent or $36.9 million decline from the same period last year. Decreased purchases within the categories of ‘Machinery and Transport Equipment’, ‘Food and Live Animals’ and ‘Export Processing Zones’, which fell by a combined $69 million during the period, contributed greatly to the overall decline in imports for the first five months of the year. However, these were partially offset by increased spending on ‘Mineral Fuels and Lubricants’, ‘Manufactured Goods’ and ‘Other Manufactures’, which rose by a combined $34.5 million. May 2017: The total value of Belize’s domestic exports for the month of May 2017 was $72.6 million, up 28.9 percent or $16.3 million from the $56.3 million recorded for May 2016. Sugar was the most dominant among the major exports during the month of May 2017, as revenues from that commodity contributed more than a half of total export earnings. Furthermore, sugar revenues for the month grew by $11.3 million, from $26.4 million to $37.7 million. The month of May was the first since the start of the year in which an increase in citrus exports was recorded. Earnings from this commodity were up by $1 million from May 2016, as orange concentrate sales rose from $11 million to $12 million. Bananas and marine products, on the other hand, each saw decreases in export returns for the period, with the former falling by $0.9 million from $7.8 million to $6.9 million, while the latter dropped by a half from $1.2 million to $0.6 million. 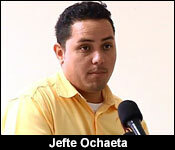 Belize’s other exports, however, performed notably well during the month. Molasses sales, which were negligible in May of 2016, surged to $3 million, and orange oil exports almost doubled from $1.4 million to $2.6 million, the result of favourable prices for that commodity. The United Kingdom was the main recipient of Belize’s exports, with $33 million worth of goods or 45 percent of total exports being destined for that nation. Exports to this country were up by $3 million over that of May 2016, as the month saw a spike in sugar exports. Robust sales of sugar and orange concentrate also drove an almost $10 million rise in exports to the rest of the European Union from $7.7 million to $17.5 million. A boost in sales of molasses to the United States of America led to a $1 million increase in exports to that country, from $10 million during May of last year to $11 million in May 2017. FIRST FIVE MONTHS OF THE YEAR: Merchandise exports for the period January to May 2017 totalled $237.6 million, up 21.8 percent or $42.6 million from the same period last year. Sugar, which accounted for 40 percent of Belize’s exports for the first five months of the year, recorded earnings of $95 million for the period January to May 2017, making that commodity the country’s most significant export earner. When compared to the five months from January to May 2016, the first five months of 2017 boasted a substantial 58 percent or $35 million growth in sugar export receipts. Belize’s other major exports also had positive showings over the period. Banana earnings were up by almost a quarter, as exports increased from $30 million in 2016 to $37 million in 2017. Improved sales of shrimp and lobster meat resulted in a modest $1.2 million growth in marine exports to almost $13 million over the period. Export revenues for crude petroleum rose significantly in comparison to the same months in 2016 from $7.1 million to $11.4 million, although there was virtually no change in exported volumes, as prices for that commodity remained more favourable than they were last year. Notwithstanding the surge in citrus exports for the month of May, revenues from that commodity fell by $14 million over the first five months of the year, from $51 million in 2016 to $37 million in 2017, due to a drop in orange concentrate sales. ECONOMY GROWS 2.1% IN FIRST QUARTER 2017: PRIMARY AND TERTIARY ACTIVITIES UP, SECONDARY ACTIVITIES DOWN. Preliminary first quarter estimates by the Statistical Institute of Belize show that, for the first three months of 2017, the country’s level of economic activity increased by 2.1 percent when compared to the same period in 2016. The total value of goods and services produced in Belize was $748.2 million, up $15.4 million from $732.8 in the first quarter of 2016. The primary sector experienced growth of 11.7 percent, as several major industries recorded increases in production during this period. The banana industry grew by more than 34 percent, this strong performance marking its recovery from the lingering effects of Hurricane Earl and the closure of one of the major farms in late 2015. Sugarcane deliveries also recorded an increase, as the industry continued to expand into the western part of the country. Livestock production grew during the quarter, with cattle seeing an increase of 70 percent while poultry production rose by 12 percent. Marine production, though substantially lower than 2015 levels, recorded an increase of 11.5 percent over the first quarter of last year, as the shrimp industry made some small strides on its road to recovery. Conversely, citrus production decreased significantly, with citrus fruit deliveries down by approximately 14 percent due to aging fruit trees, adverse weather conditions and the effects of citrus greening. Despite an increase in ‘Construction’, production within the secondary sector recorded an overall decline of 3.9 percent. Construction activities saw an increase of 8 percent, bolstered by both ongoing works on municipal recreational parks and an upswing in private construction. This was evidenced by an increase in the number of building plans approved by the Central Building Authority, a rise in the number of home improvement loans issued by financial institutions, and a 30 percent growth in the importation of cement during the quarter. The tertiary sector grew by 2.4 percent during the first quarter of 2017 when compared to the same period of 2016. ‘Government Services’ recorded an increase of 2.5 percent, while ‘Wholesale and Retail Trade’ was up by 0.8 percent. ‘Accommodation and Food Services’ grew marginally by 0.1 percent, even as the number of overnight visitors rose by 2.7 percent and cruise passengers increased by 7.5 percent. Unemployment Rate: Results from the Statistical Institute of Belize’s most recent Labour Force Survey showed that the national unemployment rate in April 2017 stood at 9 percent, a marginal increase from 8 percent in April 2016, when the country recorded its lowest unemployment rate in almost a decade. This rise in the rate of unemployment recorded was notwithstanding the net addition of more than 3,000 new jobs, as persons joined the labour force at a faster rate than that at which new jobs were created. Unemployment in the country’s rural areas rose by 1.7 percentage points, from 7.6 percent in April 2016 to 9.3 percent in April 2017, while the rate in the urban areas increased only slightly (see Figure 1). The unemployment rate was higher in all districts than in the same month of 2016 except for Cayo, where unemployment fell from 8 percent in April 2016 to 7 percent in April 2017. 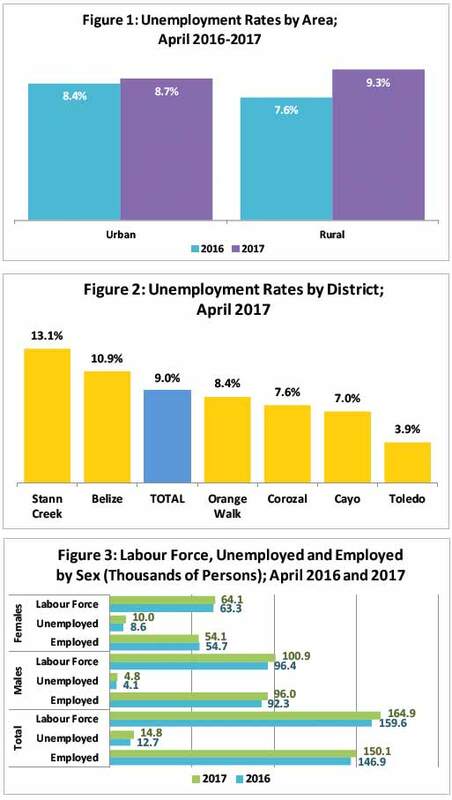 The Stann Creek district recorded the highest unemployment rate of 13.1 percent, while Toledo, where a relatively large proportion of the labour force is engaged in subsistence farming, retained the lowest rate of unemployment at 3.9 percent. The number of employed persons was also up, rising from 140,475 in September of last year to 144,302 in September 2016, as approximately 3,800 more persons were found to be working. All districts saw increases in the number of persons with jobs, except for the Belize and Stann Creek districts, which both experienced net losses of more than 1,000 jobs since last September. The Cayo district recorded the most gains in employment over the period, adding over 2,200 more jobs, a considerable portion of which was attributable to an increase in employment among persons from rural areas. Of all new jobs added during the period, almost 2,600 or two thirds went to females. Labour Force: As at April 2017, the number of persons in the labour force was estimated to be 164,935, representing an increase of 5,286 persons since April 2016. The overwhelming majority of new entrants into the labour force since April of last year, more than 4,500 persons, were males. The female workforce saw a net increase of only 762 persons, in stark contrast to April 2016, when the female labour force expanded by about 2,400. A large proportion, about 43 percent, of Belize’s labour force has only a primary level education, while 21 percent has completed up to the secondary school level. Only 18 percent of the country’s total labour force has a tertiary level education and 16.5 percent has not completed even a primary school education. Unemployed: Despite the overall gains in total jobs in April 2017, the unemployed population grew by over 2,000 persons from 12,730 in April of last year to 14,823, indicating that there were more persons entering the workforce than there were available jobs. Women entering the labour force were twice as likely to be unable to find a job, and among the newly unemployed population 1,346 were females while only 747 were males. This is particularly noteworthy, as men outnumber women in the labour force by two to one. The largest increases in jobless persons were seen in the Belize district, where the unemployed population grew by more than 1,200, and the Corozal district, which saw its unemployed population rise by over 600 persons. Cayo was the only district that experienced a decline in the number of unemployed persons. The majority of the unemployed reported that they were interested in jobs in services and sales. And the folks at Belikin aren't the only ones singing the blues due to a disruptive marketplace. Overnight tourism interests are also feeling the bite - but not from imports, most likely from AirBnB. The online service which lets you turn that spare room in your home into a lodging for guests accounts for a drop in occupancy rates - even though more overnight tourists are arriving. 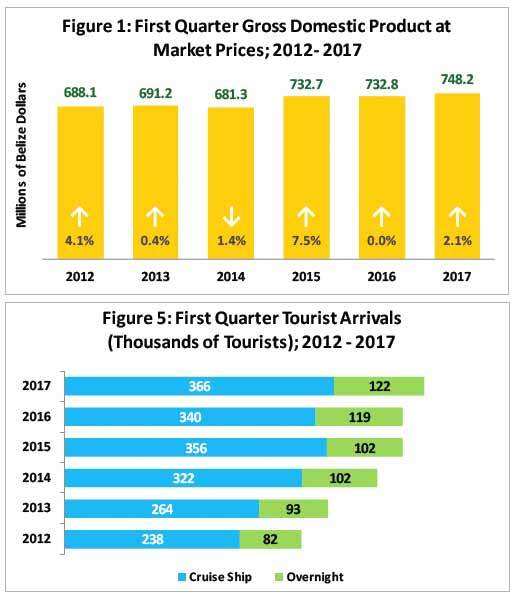 "What happened is we had more persons coming into the country however, the hotel sector where the overnight visitor would be going reported a decrease in the hotel room occupancy rate by 5%. So that means that less revenue was generated from hotels from our traditionally hotels where our traditional visitors would be visiting, that means that the dynamics of our visitors has changed. Our visitors are now going into other kinds of budget services for accommodations, so that's why we saw a decrease in the hotels and restaurants services." Do cruse ship statistics affect the overnight arrivals numbers?